Super Eagles coach Gernot Rohr will work as a pundit for a French television channel during the AFCON in Gabon, according to reports. 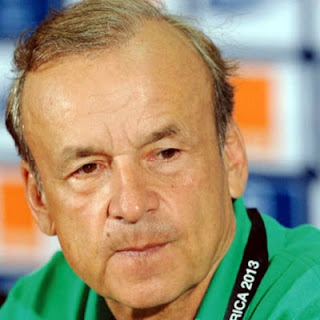 “Rohr will be a pundit for a French television network at the AFCON in Gabon,” a top source told newsmen. African football’s showpiece event will kick off on January 14 in Gabon, but Rohr will still be on vacation as the Super Eagles failed to qualify for the tournament for a second straight time. Rohr has a track record working in Africa for the past eight years after he first handled Tunisian club Etoile du Sahel in 2008. He has bossed Niger, Burkina Faso and was also in charge when co-hosts Gabon reached the quarterfinals of AFCON 2012. The Franco-German, who has been holidaying in Madagascar, the birthplace of his wife, has said he will use the AFCON to spy on World Cup rivals Cameroon and Algeria. Nigeria lead their World Cup qualifying section with six points from two matches. They resume the series in August, when they welcome second-placed Cameroon to Uyo in the first leg of a crucial double header.